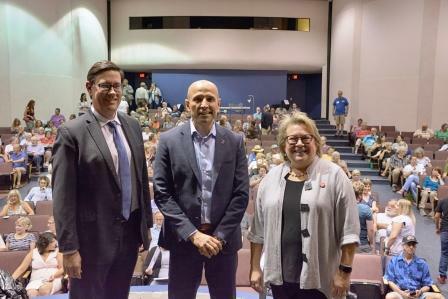 Nearly 500 people filled Sinagua Middle School Auditorium on August 7 for a debate among the three candidates seeking the Democratic nomination for Arizona Governor. Voters will choose the nominee in the primary election which is now underway and concludes on the final Election Day of August 28. Candidates Steve Farley, Kelly Fryer, and David Garcia each gave opening and closing statements and answered questions over a range of topics. The entire debate can be viewed — in segments by topic — on our YouTube channel. Thanks to John Propster — our wonderful videographer and Ryan Anderson, our photo-journalist. Thanks to the Outreach and Events Committee, which made this all possible — especially the great one hour of “Meet & Greet,” but really everything. Thanks to Lori Staudinger and Ann Heitland for moderating and, with Doug Ballard, composing the topics and questions for the candidates. Thanks to Harriet Young for sorting the audience questions. Thanks to Nathan Jones for MCing — especially at the end when everyone wanted to leave! Thanks, especially, to Shannah Redmon, who conceived this and drove it to completion!